Vincent Price Art Museum at East Los Angeles College is pleased to present 'Round the Clock: Chinese American Artists Working in Los Angeles as part of Pacific Standard Time. This unprecedented collaboration, initiated by the Getty, brings together more than sixty cultural institutions from across Southern California to tell the story of the birth of the L.A. art scene. 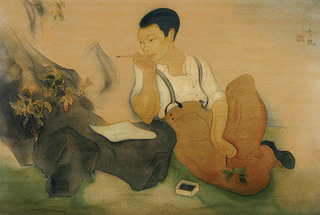 'Round the Clock: Chinese American Artists Working in Los Angeles features the work of George Chann, Jake Lee, John Kwok, Milton Quon, and Tyrus Wong, who employed their artistic abilities in their professional lives while remaining true to their own artistic pursuits in their personal lives. The exhibition features more than one hundred works by these Los Angeles-based artists, including paintings, watercolors, preproduction sketches, drawings, photographs, kites, and ephemeral materials. 'Round the Clock: Chinese American Artists Working in Los Angeles is guest curated by Sonia Mak. Saturday, January 21, 2 to 4 p.m.
Join artists Milton Quon and Tyrus Wong to celebrate the opening of 'Round the Clock: Chinese American Artists Working in Los Angeles.